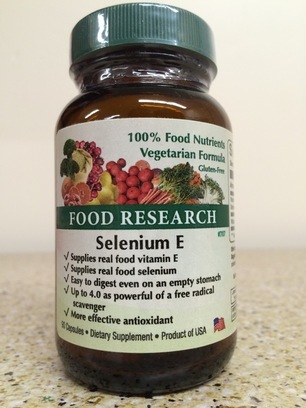 Food Selenium E Complex is a 100% Food complex nutrientwith extremely important antioxidant properties. Why another vitamin E? Because most vitamin E sold is not Food. Natural vitamin E “as found in Foods is [d]-alpha tocopherol, whereas chemical synthesis produces a mixture of eight epimers”  (natural vitamin E has recently been renamed to be called RRR-alpha-tocopherol whereas the synthetic has now been renamed to all-rac-alpha-tocopherol, though supplement labels rarely make this clear; on supplement labels d-alpha-tocopherol is generally ‘natural’, whereas dl-alpha-tocopherol is synthetic ). Natural RRR-alpha-tocopherol has 1.7 - 4.0 times the free radical scavenging strength of the other tocopherols, RRR-alpha tocopherol has 3 times the biological activity of the alpha-tocotrienol form, and synthetic vitamin E simply does not have the same biologic activity of natural vitamin E (some synthetic forms have only 2% of the biological activity of RRR-alpha-tocopherol) . The biologic activity of vitamin E is based on its ability to reverse specific vitamin E-deficiency symptoms , therefore it is a scientific fact that, overall, synthetic vitamin E has less ability to correct vitamin E deficiencies than Food vitamin E. There is an interesting reason for this, which is that the body regulates plasma vitamin E through a specific liver alpha-tocopherol transfer protein, whereas it has no such protein for other vitamin E forms . Or in other words, the liver produces a protein to handle vitamin E found in Food, but not for the synthetic forms! Even mainstream researchers teach, “Vitamin E is the exception to the paradigm that synthetic and natural vitamins are the equivalent because their molecular structures are identical...Synthetic vitamin E is produced by commercially coupling trimethylhydroquinone (TMHQ) with isophytol. This chemical reaction produces a difficult-to-separate mixture of eight isomers”  (vitamin E, of course, is not the only exception--all nutrients are better if they are Food). Isolated natural vitamin E has been found to have twice the bioavailability as synthetic vitamin E . The form of vitamin E found in Food has been found to be 2.7 times more better retained in the body than a synthetic form —this appears to be because the body attempts to rid itself of synthetic forms as quickly as possible . Food Vitamin E has been proven to have 12 micro moles per gram T.E. of lipophilic ORAC (oxygen radical absorbance capacity) —ORAC is essentially a measurement of the ability to quench free radicals (antioxidant ability). It is interesting to note that so-called “natural” forms (like succinate) do not even work like Food Vitamin E—Even the PDR notes, “d-Alpha-Tocopherol succinate itself has no antioxidant activity” , so why would anyone want that for their vitamin E supplement? Vitamin E is necessary for the optimal development and maintenance of the nervous system as well as skeletal muscle . Vitamin E deficiency can lead to certain anemias, nutritional muscular dystrophy, reproductive problems, and hyperlipidemia . Vitamin E has been shown to reduce the risk of various cancers, coronary heart disease, cataract formation, and even air pollution [2,3]. It also is believed it may slow the aging process and decrease exercise-induced oxidative stress [2,3]. Artificial fats seem to increase the need for vitamin E . Vitamin E content is highest in vegetable oils, also relatively high in avocados (4.31 i.u. each)  and rice bran . What about selenium? The three most common forms of selenium in supplements are sodium selenite, seleniomethionine, and Food selenium. The predominant form of selenium found in the body (and in Food selenium) is selenocysteine . A study using 247 mcg/day of high-selenium yeast found that plasma selenium levels were 2-fold higher than baseline values after 3 and 9 months and returned to 136% of baseline after 12 months, whereas there was a 32% increase in blood glutathione levels also seen after 9 months . This change coincided with a 26% decrease in protein-bound glutathione and a 44% decrease in the ratio of protein-bound glutathione to blood glutathione. The changes in glutathione and protein-bound glutathione were highly correlated with changes in plasma selenium levels and were believed to reflect a reduction in oxidative stress, thus it appears that Food selenium is a much stronger antioxidant than non-food forms. Oxidative stress can result in the production of glycation end-products tend to also accumulate in the brains of those who develop Alzheimer’s or similar forms of dementia . Selenium seems to support thyroid hormone production, function as part of many enzymes, have antioxidant effects, and supports cardiovascular health . It has been reported that yeast selenium seems to reduce toxicity associated with cisplatin chemotherapy  and cancer mortality in some . Based on animal research, Dr. David Williams claims that selenium is “better than a flu shot”, because selenium-deficiency “may cause a harmless strain of the flu virus to mutate into a virulent pathogen” and that selenium may reduce lung-damage associated with the flu . Sodium selenite is not a Food, but is the result of combining sodium hydroxide and selenious acid; sodium selenite is commonly used to remove green color from glass during glass manufacturing . Why would anyone want to take that as part of their food supplement? Interestingly in 1999, the Nobel prize in medicine was awarded for the finding that humans need protein chaperones in order for minerals like selenium to be absorbed into the cell. Selenium mineral salts do not contain protein chaperones, yet 100% Food Selenium E Complex naturally contains protein chaperones such as ceruloplasmin and ATX1 [18,19]. 100% Food Selenium E Complex also naturally contains superoxide dismutase (S.O.D.). S.O.D. “is one of the most important enzymes that functions as a cellular antioxidant...The absence of this enzyme is lethal” . The benefits of S.O.D. are enhanced in the presence of vitamin E . Studies show that S.O.D. is helpful for heart, lung, joints, kidneys, liver, muscles, and skin [20-22]. 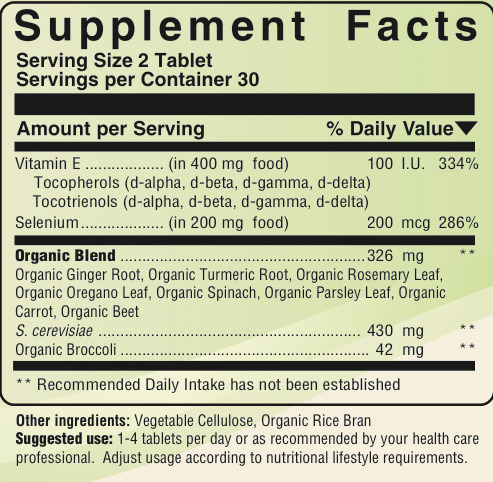 100% Food Selenium E Complex also contains rice bran and other vegetable fiber per tablet. Both soluble and insoluble are important for human health. Few women meet the National Cancer Institute recommendations for fiber . Dietary fiber helps regulate nutrient absorption, sterol metabolism, cecal fermentation, and stool weight . Shortages may lead to cholesterol problems, certain cancers, digestive problems, cardiovascular concerns, and nutrient problems [23,24]. Rice bran is also a Food source of silicon and B vitamins [11,25,26]. It is no wonder, that once they know the science, that professionals interested in optimal natural health recommend Food Selenium E Complex as the preferred 100% Food source of natural vitamin E and selenium.